When I do intricate nail designs, such as the one shown here, and after my nail art has dried, I want a topcoat that protects, shines, and makes the manicure last longer. That is exactly what the Butter London Hardwear Pretty Darn Quick Topcoat does. Last week, I showed you what the Butter London Basecoat can do, this week I'll show you how good their Topcoat looks. If you love both, you can get them in this set, which I think is a better deal. They both come in a bigger size than regular-sized nail polish (0.6 fl oz instead of 0.5) and the packaging is very appealing. I experienced no shrinkage whatsoever, no smudges nor bubbling, and it had just the right consistency, not to watery or too thick. The pictures really speak for themselves, this shines like glass. This is so pretty! Open Seas is one of my favorite greens and the glitter kicks it up a notch! @ The Frustrated Fashionista: Thank you, you are not going to believe it but this is my first time trying a mint/jade color in years (since the 90s?) and I am loving it right now! Well pretty much enjoying any shade of green lately. This is too light and glittery for me!!! 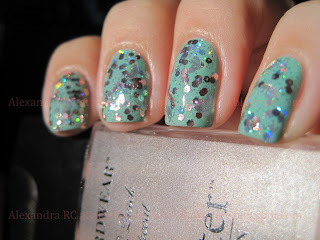 Love that green, especially with the glitter combo, very pretty. I've been looking for a good base/topcoat I'll have to check those out!